Submissions to the Yahoo! Directory used to be very difficult. Surveys showed that people who had managed to get their sites listed in the directory had to try multiple times over a matter of months. It was free, but it was a hassle. It seems likely that getting into its directory ensures that you get into the Yahoo! 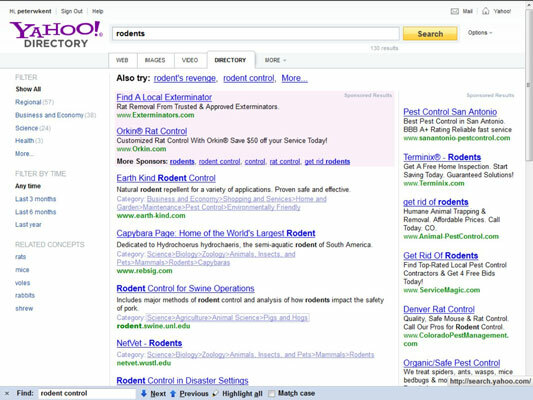 Web Search and may even improve your indexing in Yahoo! Web Search. The company actually states that it “can increase the likelihood,” but doesn’t guarantee inclusion. It’s crawled by other search engines, such as Google, so having a link in the directory helps the search engines find your site and may encourage them to index it. Search engines use the directory to help them categorize your site. Some people do use the directory. If your site is in the directory, you may be able to place a cheap ad at the top of your category. Preferably the card is yours or that of someone who has given you permission to spend $299 (or is it $600?). Open your browser and go to Yahoo! Directory. You’re going to make sure that your site isn’t already included. After the page has loaded, type your domain name into the Search box and click Search. If you have total control over your site, this step isn’t necessary; of course, you’ll know whether your site is already listed. But, for example, if you inherited it from another department in the company you work for, who knows, it may already be there. If it isn’t, move to the next step. Return to the Yahoo! Directory main page and browse through the categories looking for the best match for your site. Look for a link that reads something like Suggest a Site or perhaps a promotional box of some kind. The link is probably somewhere in the top right of the page. You have to enter a site description, contact and billing information, and so on. Because of the sheer volume of categories, picking a category is not as simple as it might seem. Yahoo! Directory has 14 major categories, and many thousands of subcategories. But understanding a few points about hunting for and submitting to a category can make the process a little smoother. You need to choose a fairly specific category. You can’t submit to a category or subcategory if it only holds other subcategories. For instance, you can’t submit a site to the Business & Economy category; it’s just too broad. Rather, you have to drill down farther into the subcategories and find a category that’s specific enough to contain actual websites. One good strategy is to look for your competitors: What categories are they assigned to? If you find a category with a whole bunch of companies similar to yours, you’ve probably found the right one. While you move through Yahoo! Directory, you see that some category names have an @ sign at the end, such as Graduate Programs@, Booksellers@, Intranet@, and so on. These cross-references are to categories under different branches of the directory. For instance, if you browse down the directory to Recreation & Sports > Travel, you see a link to Tour Operators@; click this link, and you jump over to Business and Economy > Shopping and Services > Travel and Transportation > Tour Operators. In fact, virtually every website that sells or promotes a product ends up somewhere under Business and Economy, even if it’s linked from other parts of the directory. Also, you have to be inside an actual category before you can add a page. This is a little confusing, perhaps. When you first search in the directory, Yahoo! displays a page that contains a list of categories and a whole bunch of websites that match your search but from various different categories. Thus, you’re not actually inside a category at this point, so you can’t add a page here, but you will see links that take you into specific categories. By the way, Yahoo! may not take your advice; it may put your site into a different category. If you’re convinced your choice is best, ask them to change.